The Top 15 Historical Sites in West Virginia! Along with a rich and varied culture in music, food, and local customs, West Virginia has been the site of numerous historic events and birthplace of many achievements. From underground bunkers, to telescope prototypes, to historic asylums, West Virginia is home to a fascinating history worth exploring. These 15 sites give you an idea of what the 35th state has contributed to our national history. Called the birthplace of Mother's Day, it was here where three congregations merged to create a shrine dedicated to Anna Jarvis, who wanted to celebrate and honor mothers. Although no longer used as for regular church services, there is a special Mother's Day service each year. Comprised of three main railroad buildings and sitting on 13 acres in Martinsburg, West Virginia, the Martinsburg Roundhouse for the Baltimore and Ohio Railroad was used as a central link for transportation and locomotive repair during the Civil War. Confederal troops burned the Roundhouse Complex in 1862, but it was rebuilt a few years later, and became the site of the first nationwide railroad strike that spread to other parts of the country in protest of pay cuts for rail workers. Home to Alexander Campbell, a local minister and his family in Bethany, West Virginia, in the early 1800s, the house and adjacent buildings became known for southern hospitality and religious training. Campbell was instrumental in promoting the Restoration Movement and the formation of the Disciples of Christ and Churches of God denominations, and became the founder and first president of Bethany College in 1840. Clover Site in Lesage, West Virginia, is an ancient cultural site known for the well-preserved prehistoric Native American village that was once there. Declared a National Historic Landmark in 1992, discoveries on the property include shell ceramics, tools, and ornaments made by the local natives, and those discoveries provided evidence that there was connection with other villages, some as far away as Mississippi. There are six National Register Historic Landmarks on the campus of Davis and Elkins College campus, including four that make up the Historic District. The Historic District includes Graceland, a stone mansion originally built as the summer home for state senator Henry Gassaway David, Halliehurst, the home of U.S. Senator Stephen Benton Elkins, The Icehouse, built in the late 1800s, and the Gatehouse, which serves as the entrance to the college. Originally containing 140 beehive coke ovens, many of the ovens and surrounding buildings were demolished out of necessity due to deterioration and danger to visitors, but there are still several coke ovens and the coke loader still present. Beehive ovens are known for their unique dome-shaped design and the ones remaining at the Historic District in Bretz, West Virginia, are the last ones that operated in the U.S.
Now part of a larger archaeological complex, Grace Creek Mound in Moundsville, West Virginia, is the largest and one of the most famous conical burial mounds in the world. A museum was built on site in 1978 and offers exhibits and displays showcase the Adena mound builders from prehistoric times, who constructed the site over a period of 100 years. Once the best-kept secret in the nation, the elegant Greenbrier Resort housed an underground bunker for our political leaders in the event of a nuclear attack. Decommissioned in 1992, the bunker is now open to the public. Visitors can see the emergency television studio, water plant, decontamination areas, and several of the rooms that could house up to 1,000 people. Located in the middle of Hatfield/McCoy territory, this area has also been the site of the Mine Wars in the 1920s that resulted in the Massacre of Matewan and the Battle of Blair Mountain, the largest fight between union representatives and labor workers. The Matewan Historic District in Matewan, West Virginia, was declared a National Historic District in 1997, and visitors can stop by the Matewan Museum to learn more about this part of the state's colorful history. Once a booming timber town owned by the West Virginia Pulp and Paper Company until 1963 when the state bought the railroad, lumberjacks and their families lived in company-owned houses and did business in company stores. The Cass Historic District includes a general store, a museum of history, and 20 renovated houses that can be rented by those wishing to stay overnight. Train enthusiasts will appreciate learning about the unique Shay locomotives that ran up and down Cheat Mountain and brought the cut timber down to the paper mill in Cass for processing. Originally built in Illinois in 1937, this amazing structure was the prototype for the first large-dish radio telescope and profoundly helped define the field of radio astronomy. The telescope was sold and moved several times over the years, coming home to Green Bank, West Virginia. This marvelous piece of space history was listed on the National Register of Historic Places in 1972. If extra-terrestrial investigation appeals to you, then you'll want to stop by and visit the Reber Radio Telescope. 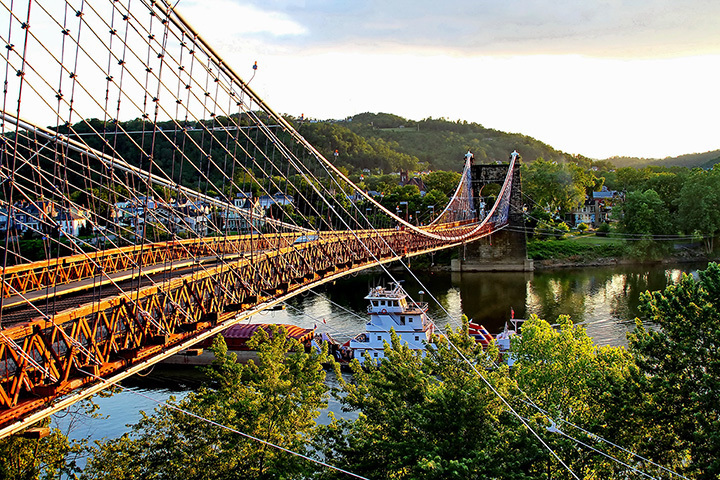 Once the largest suspension bridge of its kind in the world, the Wheeling Suspension Bridge in Wheeling, West Virginia, was constructed in 1847 and crossed the Ohio River and was built with local resources. Given the highest honor as a National Historic Landmark, the bridge has been restored and reinforced over the years to remain one of the most significant and historic examples of pre-Civil War engineering. The Alexander Wade House in Morgantown, West Virginia, was home to renowned educator, Alexander Wade, who was credited with creating a system for examinations and graduations for rural students in the mid-to late 1800s. Wade's home was declared a National Historic Landmark in 1965. Even before Abraham Lincoln signed the document that allowed West Virginia to become a state at the start of the Civil War, West Virginia Independence Hall in Wheeling, West Virginia, originally called the Wheeling Custom House, was being built. During the war, this building served as the capital building for the Restored Government of Virginia, later known as West Virginia. Formerly known as Weston State Hospital, the Trans-Allegheny Lunatic Asylum was originally built to hold and treat 250 patients, but in its history of overcrowding and questionable treatments, there were over 2,400 people living there. Officially closed in 1994 and auctioned off for demolition in 2007 because of asbestos violations, several existing buildings can be toured and have been featured on television programs for paranormal activity. View more West Virginia Historical Sites.